I enjoy cooking when in the mood, especially when having friends over. But grocery shopping for everyday meals has to be one of life’s less pleasant pastimes. Thank heavens we’ve finally found a lovely Zimbabwean nanny, so she’ll she’ll take over cooking up junior meal components to a large degree. Fresh fish is hard to find in shopping centres, but on a warm spring evening it’s what we felt like eating. 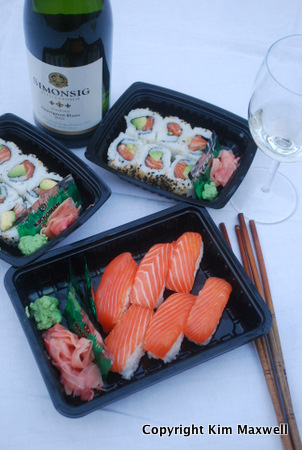 Our Sunday night supper solution was sushi and salmon to go from Pick n Pay V&A. I support local ingredients but the local tuna looked scarily grey and worth steering clear of. The perky Norwegian salmon sushi was affordable, tasty and worth buying however. Partnered with a zesty tropical fruit salad burst of Simonsig Sunbird Sauvignon Blanc 2010, this made a brilliant early Sunday supper. We paid R73 for six salmon nigiri (the shaped rice with fish on top), plus 12 salmon and avo rolls, comfortably feeding two. The nigiri was cut to order by the two guys behind the counter (it’s adjacent to where they sell cigarettes and airtime). Wasabe, pickled ginger and Kikkoman soya sauce sachets are included. The Simonsig Sunbird Sauvignon Blanc retails at around R55. The grapes were sourced from this Stellenbosch farm, plus Darling and Elgin. All good Sauvignon areas, so no surprise there. Unwooded Chardonnay or bubbly is often my preferred sushi partner because it offers more oomph, but the time in bottle gave this wine the palate weight required. Simple, satisfying. Sauvignon and Sunday sushi supper in. And I do have a few questions for you if it's allright. Is it simply me or does it look like some of the comments look as if they are left by brain dead individuals? :-P And, if you are posting on other online sites, I would like to follow anything fresh you have to post. Would you list of every one of your public pages like your twitter feed, Facebook page or linkedin profile?